Welcome to DayTradingLife.com A website dedicated to help you become a Super Trader. We think in pictures. This is a well known fact. Below I list 2 free PDF Reader options for your preference. An excellent lightweight and quick loading alternative to the market leading Adobe Reader listed above. Super Trader Mind Map Revised. New Revised ‘Post Trade System’ To Reflect A Super Trader’s ‘Goal Orientated’ Approach, Including ‘EQ’ Emotional Behaviour – ‘Character Goal’ Reviews. Reference To Dr. Van Tharp’s ‘Position Sizing’™ Now Inserted Into ‘Money Management’ Category. The Strongest Emotion Of All? Usually Stated As FEAR,,But The Strongest Emotion Is ‘CONFIDENCE’ (Now Added To STMM), For It Is Only ‘CONFIDENCE’ That Can Over Come FEAR. All ST’s Have A Burning ‘Desire’, By Products Of One’s Motivation & Commitment. Awareness & Consciousness Added To Reflect The Epitome Of All Super Traders. Super Trader Mind Map Revised, New Framing & Background Theme. All FREE Downloadable PDF Versions. Both FREE Downloadable PDF Versions. Includes-Hyper linked Downloadable PDF, ‘Super Traders Are Visionaries.’All categories and sub-categories within this Super Trader Mind Map PDF will (in time) have corresponding downloadable material expanding on the categories related to it’s subject matter. I thank you for stopping by my Day Trading Website. Never seen a trader mind map before. I look forward to your planned updates. Many Thanks for your kind words Jure. Super Trader Mind Map will be constantly updated, with some excel spreadsheets soon to follow etc. Best Subscribe to my feed so you will know when updates have been added. A book chapter could be written on every box on this thing! Thanks for your effort! Great work! Thanks for all the efforts! Great site! Great blog posts almost across the board, very impressive. The only issue I have with your material is goal setting. Goal setting is in major conflict to almost everything else on your blog and you may not even realize it. I am not here to preach anything to you other than you may want to do a lot more thinking about the concept of goal setting in general as to how it relates to trading, discipline, and living in the now. In my experience trading the markets I tend to notice that the market provides opportunities when it provides opportunities and it doesn’t when it doesn’t. The point being, that daily, weekly, monthly, and maybe yearly goals are only obtainable through the opportunities provided. As such, if there are no opportunities provided the conscious mind, and perhaps the subconscious mind, tend to “force” bad trades all in the name of achieving an unobtainable goal set in the past. The major issue is that when the goal or goals were set you began to impose your will on the world which in my experience not only doesn’t work, its futile and ends in disaster. How can you or anyone know what’s in store over the next day, week, month, or year and then attempt to take personal responsibility for that??? Been there done that…not a fun way to live…accepting what the markets and the world have to offer is much more at peace and in harmony with the natural organic laws of the markets and the universe. Goal setting in my opinion is all about the future, all about not accepting what is…in the here and now, and wanting things different than the way they are. In my experience those are all a recipe for failure, not success. If you really examine goal setting at its core it has about an 80% failure rate. On top of that, many short term goals are in total and complete conflict with long term goals. Real goals, or true goals, are not tangible (they are feelings) and supersede everything else, yet most people have no conscious idea what this means. Conscious goal setting is often incongruent with one’s true goals which is why they are doomed to fail. If success is what you seek, goal setting is a piss poor way of achieving it and sends more people to poor house in trading than almost anything I’ve ever seen. I’d start by asking yourself what your definition of success is and where did you come up with that as a definition to begin with?? On top of that show me any evidence from anywhere that says that goal setting actually works. Sure you can find anecdotal stories everywhere and we all have set and achieved goals but mostly we fail. This selection bias of only looking at the winners in the process reminds much of why traders lose money. They do something once and it works and then they keep doing it until they have no money left. All losing systems have winning trades and all winning systems have losing trades. The problem is…there are millions of ways to fail and probably only a hundred ways to succeed in trading. Thank you for your comments regarding goals/goal setting (incorporated into my ST Mindmap). After reading your comments, here is my reply. I am not offended by your comments Jason, debate is healthy; but I am completely aware of the role/structure that goals and goal setting play within the Super Trader’s Matrix. We can talk in semantics, IE let’s choose the words ‘focus’ or ‘discipline’ or ‘rules’, ‘vision’ etc etc. Whilst these words are important individually, and key concepts within a S.T’s make up, there is a ‘holarchy’ at work. All these parts naturally make up the whole, that support one another and are not as individual as first envisioned; but each ‘feed’ off each other, support one another, creating this Eco system, a living breathing system at work (The Super Trader’s Matrix) that strives for perfection within the day trading arena. So goals and a goal setting framework ultimately cannot be conceived as a individualistic part at work, but more of an essential ‘organ’ that CANNOT be excluded as it is as essential to his system as our heart/liver/kidneys are to our survival. My reply is an agreement to some degree. Change Your Thoughts – Change Your Life by Wayne Dyer. Well, this leads me to assume you are well read (or have some understanding of the mind body connection, and with Mr. Dyer’s material (Similar to Chopra’s,) that time is illusionary, we live in the NOW. ALL WE HAVE IS THE NOW J! So, to some degree, I believe we agree. What’s truly important is what we do in the now, do this, and the future will take care of its self. Answer: “Don’t set goals that are not congruent with your deepest values and belief based system. Why would you do this?” I don’t actually see any logic in this statement. Why Do Super Trader’s Use Goals? Top 10 Reasons. NEVER UNDERESTIMATE THE TRUE POWER OF GOALS! In the above 10 reasons there is 1 that is so SO important to the day trader, and it’s trading in ‘The Now’, trading at the highest level one can, (which ultimately leads to focusing purely on ‘the process’ of trading’) that said, reason 8 is key. “Goals for the Super Trader are used as a lens, shifting one’s ‘Frame Of Reference’ (His Thinking & Awareness) to envision new opportunities, guiding ones’ decisions within a structured ‘INTENTIONAL’ framework via conscious choice. So Jason, via goals you will see opportunities that you just wouldn’t be looking for if you didn’t instigate a goal orientated approach. It’s a bit like when you buy a brand new car, drive it for a few days, but instantly you notice all these cars exactly the same as your new car on the road. they always were there, but you just weren’t aware of them. Opportunities to improve are always present for the Super Trader, and using a structured, rational and systematic approach via goal setting instigates a model that will shift your awareness to seek new opportunities that one wouldn’t even dream of if a goal approach wasn’t part of the mix. THIS IS WHY GOALS ARE PART OF THE SUPER TRADER’S MATRIX. I hope you might reconsider a goal approach in your trading strategy Jason. I haven’t gone into great detail or given trade examples etc, but I hope the above comments might make you consider that goals can and do play an important role in trading at the highest level. Not sure if you’ve read any of Marcus Buckingham’s work on Strengths, but his philosophy is very similar to yours. You can’t learn success by simply studying failure. 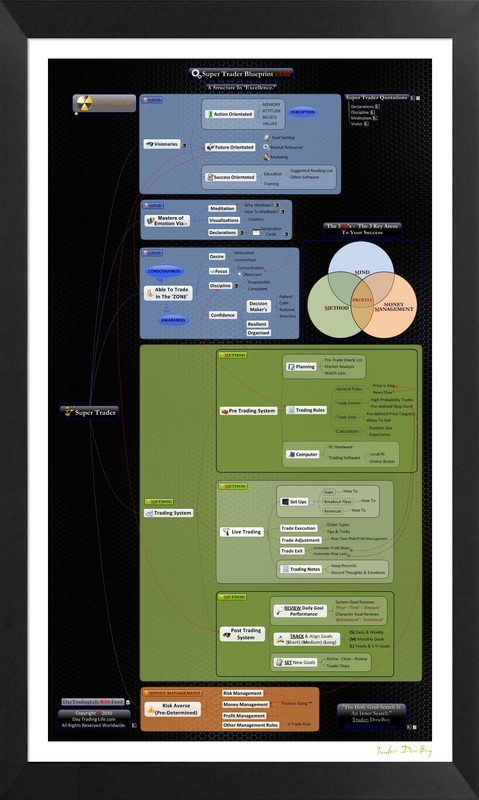 Lastly, how did you create the Super Trader Mind Map picture? Is it a series of mini mind maps merged in Photoshop or something completely different? I’m keen to adapt your concept to another topic. Many thanks for your comments Brad. Yes, how Marcus explains and rationalizes how we as humans tend to be drawn to study subjects in a way that initiates a need to actually focus more on the negative and opposite attributes of the very subject matter we wish to improve on! This is a major stumbling block that most people face when learning new skills. We are in an information age when we feel the need to know more and more, yet it’s not the volume of information that is important, it’s where we chose to focus and what we focus on that is important. This is an excellent piece of software for mindmapping. I will include a mindjet version of my ST Mind Map soon which will make this a lot more interactive. I hope to publish some more material very shortly. I just wanted to say thanks for everything you’ve provided. When I was in college, I took a course in Psychology of Personal Effective, and ever since I’ve always been intrigued by psychology. The material you’ve provided is similar to the exercises we would go through and your illustrations of the thought process and goal setting is similar, just in terms of trading. Great job.